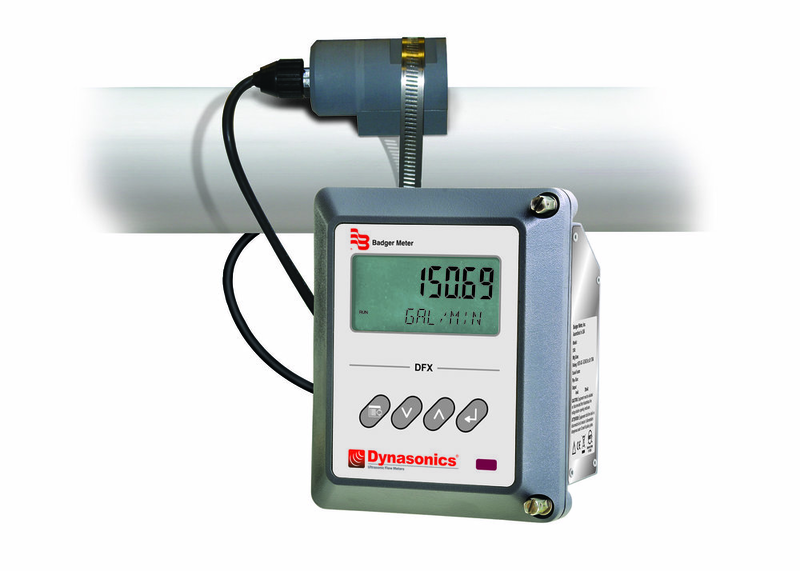 The DFX ultrasonic Doppler flow meter measures flows of liquids containing suspended particles or aerated liquids. The suspended particles must reflect ultrasonic energy. The DFX flow meter operates by transmitting ultrasonic waves into the flow stream and measuring the frequency shift of the reflected wave. The meter’s clamp-on design allows quick and low-cost installation, and eliminates worries of fluid compatibility and pressure head loss. A hot-tappable insertion probe transducer is available for installation on pipe systems that do not permit ultrasound penetration. With no moving parts, there is no mechanical wear, so repair kits or replacement parts are not needed. Successful application of Doppler ultrasonic flow meters relies on three physical constraints. The speed of sound of the reflector must vary by greater than 10% from that of the liquid carrier. Particles must be large enough to cause longitudinal reflection. Particles greater than 35 micron size meet this criteria. In typical applications, there is often a distribution of particle sizes. If the volume of particles greater than 100 microns is 25% of the overall particle volume, then the reflectors are adequate for a Doppler ultrasonic flow meter. The reflecting material must travel at the same velocity as the fluid for good accuracy. Upward flowing pipes running at low velocities may not carry heavier reflectors at the same velocity as the carrying liquid - leading to inaccurate flow measurements. The pipe must be completely filled with liquid when measurements are made. The DFX microprocessor assumes that the pipe is completely full when it calculates flow rate. Use on partially-filled pipes may result in inaccurate readings.